I read this event at the last minute over at boo’s, which is Hay Hay Its Donna Day, a One Off Meme. I guess I can forego the introduction of Donna Hay, since there are many who had introduced her. This event was inspired by Nic’s post, which I had since ages ago copied it into my to-do list until today. Since the event is alive and kicking all over the world, I might as well join in the fun and take off something from the ever-ongoing list of mine. Though I do not know much bout Donna Hay but I did flipped through her magazines and books before in MPH. I did that a lot last time during my internship, at lunch break. I used to gather a bunch of food magazines and recipe books, grab a nice lawn chair; yes they have that in Midvalley MPH with a nice “garden-like” surrounding. All I know is that she uses straightforward and simple approach in her recipes, which many including me simple love it. When I read the ingenious boo making her cupcake swirled with kaya, a local coconut egg jam, I swore a bulb just lighted up in my head. I had two kinds of kaya in my fridge which seems to be there for ages, which no one in this house seems to be interested in. How in the world did it get there in the first place? Well, at the period when everyone got sick in this house, including me, my housemates bought kaya and bread, a seemingly usual fare for the sick in common Malaysia household. I wonder where they get that idea, but nonetheless, my housemate followed the tradition but naturally, only eat a little, with the bad appetite when you’re sick. That is not the problem. The big problem is, they do not even eat it at all after they got well. I do not understand why myself. We love kaya but it just happens to stay stuck in my fridge forever. When I look at the recipe from Nic, I found that it was for 12 muffin tins. All I have was a 6 cup muffin tray that fits in snugly in my mini oven, which you all know quite well; therefore I halved everything, which I think, did not work out that well. I got the same problem again when I added in the flour and found it too dry, I wonder what am I doing wrong considering it a deja-vu, since I had the same problem with my Chocolate Chip ‘Orange’ Cookie. Anyway, I was compelled to use orange juice again but then it struck me that it would not go well with pandan kaya that I would be using. So I guess I would just use milk, which I have to brew from the milk powder; I ran out of fresh milk. Then when I scooped it into my muffin tray, I found I can only make up to 5. I wondered why again. Next, when I scooped in the kaya, the lazy me had just grab the nearest possible thing in sight, my chopstick, to swirl it and I nearly messed it up. Anyhow, it ended up not bad looking. I guess it was not that attractive as the pandan kaya had a very light green colour which does not really stand out like how nutella would have. Nonetheless, it looks sweet. There are even some with swirl of sticky kaya remaining on the top! The cupcake is soft cake texture with a hint of pandan. Real nice. Thanks to Nic for a very versatile and adaptable recipe. Pardon the conversions as I do not know how to halve 3/4 cup. Use your imagination. Grease 5 holes of the muffin tray with butter. Add in eggs one at a time, until fully incorporated. Add vanilla. In a bowl, mix in flour, salt and baking powder then stir it into batter and mix until uniform. Add in milk and stir till incorporate. Fill up the muffin tray bout 3/4 full each with batter. 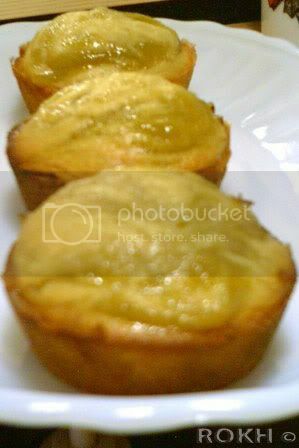 Top each cake with 1 tsp kaya and swirl it in with a toothpick (if you’re wiser). Make 5 sweet looking muffins. Update: Get the round up over at winosandfoodies. Enjoy!